Introduction/Purpose: To determine if ingestion of the dietary supplement creatine ethyl ester results in statistically and clinically relevant elevation in serum and urine creatinine levels, a crossover trial in which participants will receive creatine ethyl ester or creatine monohydrate will be employed. Methods: In this IRB-approved, blinded, crossover trial, 25 healthy subjects ingested 10 grams of either creatine ethyl ester or creatine monohydrate. Each subject served as his or her own control and ingested the other sample greater than two weeks later. Serum and urine creatinine were assayed at 0,1,2,3,4,6, and 24 hours after acute ingestion. Statistical analysis was performed by Wilcoxon Matched Pair Signed-Ranks test. All subjects completed informed consent documentation prior to participation. Results: All subjects had significant increases in serum creatinine. 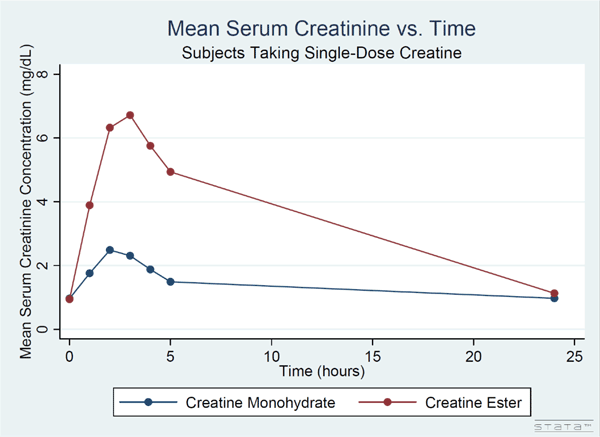 For the creatine monohydrate group; baseline mean serum creatinine (Crn) was 0.97 +/- 0.13 mg/dL, peak mean serum Crn was 2.49 +/- 0.81mg/dL, and 24 hour post-ingestion Crn was 0.97 +/- 0.14 mg/ dL. For the creatine ethyl ester group: baseline mean serum Crn was 0.94 +/- 0.14mg/d; peak mean serum Crn was 6.71 +/- 1.59 mg/dL; 24hr post ingestion serum Crn was 1.13 +/- 0.23 mg/dL. Conclusion: Serum creatinine was elevated to levels mimicking acute kidney injury (AKI) in both creatine monohydrate and Creatine Ethyl Ester groups. Urine creatinine after ingestion of single-dose creatine ethyl ester demonstrated an excretion pattern, whereas urine creatinine after ingestion of single-dose Creatine Monohydrate demonstrated an absorption pattern. These findings support other research suggesting Creatine Ethyl Ester may actually break down and excrete it before it is active as an ergogenic substance. Additionally, these findings provide important context for interpreting serum creatinine values that would otherwise indicate an AKI in patients who use creatine supplements. Creatine is an organic acid that is synthesized from arginine, glycine, and methionine in a two-step reaction involving the kidney (1st step) and the liver (2nd step) (13). It can also be ingested from various meat sources, with the highest concentrations being found in some cuts of beef (21). Creatine acts as an energy buffer by directly rephosphorylating ADP to create ATP during short duration exercise; specifically, creatine acts when endogenous ATP sources are depleted during the first 10 seconds of exercise and glycolysis has not yet taken over as the primary means of generating ATP within the muscle cell (21). Creatine also seems to localize within muscle cells, further demonstrating its efficiency as a buffer system (36). As a nutritional supplement, creatine (Cr) that has been available over-the-counter since 1993, and it is one of the most widely used among athletes as an ergogenic substance. From 1996 to 2001, the sales of creatine went from $50 million to over $400 million, and the rate of use is among one subset of the population, collegiate athletes, is estimated to be between 25- 78% (2, 22). In the decades since its inception as an over-the- counter supplement, Creatine Monohydrate (CrM) has been involved in hundreds of randomized controlled trials to tease out the potential benefits of creatine supplementation. The benefits demonstrated in these studies include enhancements in lean-body mass, total creatine content in skeletal muscle, power development during exercise, rate of force-development, total work performed, and muscle fiber diameter (3, 4). Currently, creatine use is legal does not appear on the prohibited list published by World Anti-Doping Agency (WADA) at the time of this publication(27). The athletes that seem to benefit the most from creatine supplementation are those that engage in high-intensity, short duration events, which last less than 30 seconds (19). Moreover, the FDA in 2002 approved creatine for research aimed at attempting to slow the progression of ALS and Huntington’s disease and studies are in Phase III of their trials. Parkinson’s disease is the subject of creatine research as well, and the NET-PD study, approved by the FDA and run by the NIH and National Institute of Neurological Disorders and Stroke, is also in Phase III. Phase II trials of creatine use in ALS, Huntington’s, and Parkinson’s diseases have demonstrated potential slowed progression of both diseases (1, 31, 32). There are effectively no known adverse clinical effects to creatine use. 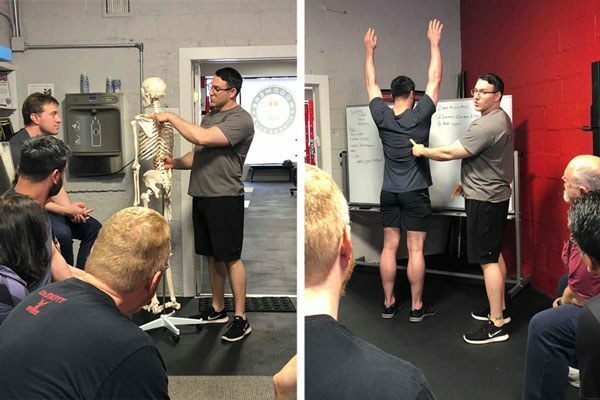 Gastrointestinal disturbances and muscle cramps have been reported occasionally in healthy individuals, but these reports are subjective and anecdotal. Additionally, liver and kidney dysfunction have also been suggested based on small changes in markers of organ function and of occasional case reports. However, well-controlled studies on the adverse effects of exogenous creatine supplementation have not been published at the time of this writing. Poortman et al. investigated liver changes during 4-weeks of creatine supplementation in young athletes. No subjects showed any evidence of dysfunction on the basis of serum enzymes and urea production (26). Aside from mild weight gain from water retention, among healthy subjects mostly anecdotal reports of mild side effects exist. These include anxiety, diarrhea, dyspnea, fatigue, migraine headache, myopathy, nausea/vomiting, nervousness, and unspecified rashes (19). Long term effects of creatine use have been studied over a 5 year period among healthy athletes and have not been demonstrated to adversely affect metabolic markers, muscle or liver enzymes, electrolytes, lipid profiles, hematological markers, or lymphocytes (20). The majority of commercially available formulations of creatine marketed as a dietary supplement have classically been some salt formulation of creatine monohydrate, with attempts at changing the salt formulation to improve solubility and plasma levels (18). Creatine monohydrate readily enters serum from the GI tract, with nearly 100% arterial bioavailability (24, 25, 29). However, this formulation has less than desirable pharmacokinetics, with low water solubility and cell membrane permeability, indicating that creatine monohydrate may not readily enter muscle cells (7, 8, 21, 24). Moreover, some evidence demonstrates that weight gain in creatine use is linked to glucose and water co-transport into muscle cells, theorized to be through an insulin-mediated mechanism (11). For some athletes, this translates into an undesirable weight gain. In 2003 the patent for “creatine ester pronutrients” was filed as an alternative to creatine monohydrate, with the claim that the ester group makes the molecule more lipophilic (34). This is thought to bypass any water solubility requirement to gain entry into plasma, as well as theoretically avoiding excessive weight gain through glucose and water co-transport. Two recent studies have refuted the ability of creatine ester to not only enter plasma, but the ability of creatine ester to enter muscle cells whatsoever. A simple study was done with creatine ester incubated in 1 M HCl, representing gastric acid. This study demonstrated, depending on the formulation, between a 62-73% bioavailability of creatine after only 30 minutes, and a 11-72% bioavailability at 120 minutes, opposed to 99% bioavailability of creatine monohydrate at 120 minutes (5). In a recent in vivo study, creatine ester was found to be degraded directly to creatinine, likely by plasma cholinesterase. Moreover, addition of creatine ester to human serum resulted in the detection of only creatinine after an incubation period of 4 hours, in contrast to the addition of creatine monohydrate, which demonstrated mostly a large peak in the NMR spectrum representing creatine (10). 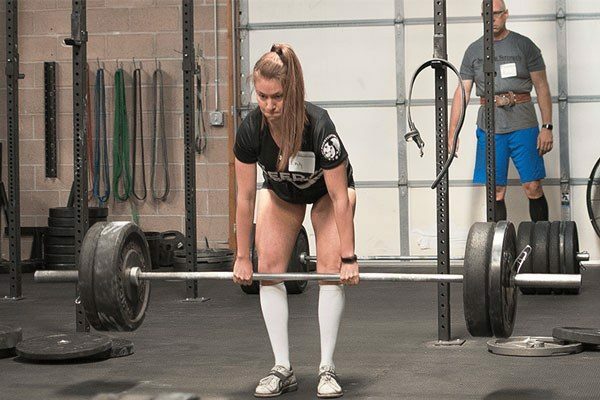 In spite of this evidence, athletes continue to use creatine ester in the hope of making strength gains without bodyweight gain. If creatine ester use has an effect on serum creatinine, this may be of significant relevance to clinicians who assay serum creatinine to assess renal function. For this reason, we seek to determine if creatine ester consumption has a statistically significant as well as clinically significant effect on serum and urine creatinine concentrations. Creatinine is a breakdown product of the body’s total creatine pool, which includes both free creatine and creatine phosphate. The pool is mostly limited to skeletal muscle, which makes up 95% of the total creatine pool and the remaining 5% is found in organs like the kidney and brain. Both creatine and creatine phosphate spontaneously cyclize into creatinine in constant, irreversible, non-enzymatic process with about 1.1% of the body’s creatine and 2.6% of the body’s creatine phosphate cyclizing into creatinine (36). These cycling creatine stores are replenished on a daily basis from either creatine in the diet sourced from meat or from de novo synthesis using a two- step process involving the kidney and liver (35). After cyclizing, creatinine then leaves the muscle tissue to diffuse into the blood stream and finally get filtered through the glomerulus of the kidney for excretion (13). The process of non-enzymatic cyclization from creatine to creatinine is fairly constant such that creatinine can be used as an indicator of existing muscle mass. For example, a 70kg male with ~120 g of total body creatine stores produces about 2g/day of creatinine from these stores (36, 38). Where UCr= urinary creatinine concentration, V= urine flow rate, and SCr= serum creatinine concentration. Due to the tubular secretion of creatinine in the proximal tubule, creatinine clearance tends to overestimate GFR by 10- 20%, though it is thought to be balanced out by the measurement error of equal proportions when using the alkaline picrate method (Jaffe’s method) to measure serum creatinine (8, 9). Failure (Stage 3) -Increase in serum creatinine to 3.0 times baseline, or increase in serum creatinine to ≥4.0 mg/dL (≥353.6 micromol/L), or reduction in urine output to <0.3 mL/kg per hour for ≥24 hours, or anuria for ≥12 hours, or the initiation of renal replacement therapy, or, in patients <18 years, decrease in eGFR to <35 mL/min per 1.73 m2. Alterations in renal function remain the chief concern among clinicians (26). There is conflicting evidence as to whether creatine consumption in healthy users has an effect on serum or urinary creatinine levels. Some evidence suggests that the effect is minimal in healthy individuals, with a reversible rise of approximately 30% in serum creatinine and a concomitant rise in urinary creatinine, thereby not affecting glomerular filtration rate (21). Even among elderly Parkinsonian patients, only 9% of individuals demonstrated an increase in serum creatinine (32). The serum serum-creatinine associated AKI definitions are of relevance to this investigation, particularly the values listed in stages 2 and 3 of the KDIGO-modified RIFLE criteria. This study utilized a blinded crossover design, with each participant serving as his or her own control. The first arm of the study had participants receiving a 10-gram dose of creatine monohydrate. Two weeks following the first treatment, participants received the other treatment, creatine ethyl ester, which was the second treatment arm. IRB Approval was obtained from Albert Einstein College of Medicine’s institutional review board. The trial was registered at ClinicalTrials.gov under the number NCT013677. The study was done at Beth Israel Medical Center (New York, New York). 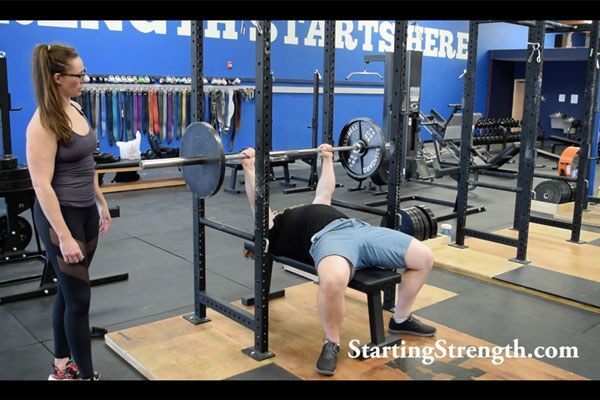 During the first visit, each subject ingested 10 grams of commercially available creatine monohydrate orally (GNC Pro Performance Fruit Punch Creatine Monohydrate) that was solubilized with 8 oz. of water and 2 tablespoons of Tang brand orange flavored drink mix (Tang brand Orange Drink, Kraft Foods). This was equivalent to two teaspoons according to the manufacturer's recommendations. Serum Crn was assayed at 0, 1, 2, 3, 4, 5 and 24 hours. Urine samples were obtained and assayed for urinary Crn levels were assayed at 0, 1.5, 3, 5 and 24 hours. Two weeks later the 25 subjects returned to the lab to allow for complete wash out of the creatine monohydrate. Each subject then ingested 10 grams of creatine ethyl ester orally (CE2 Rapid Absorption Ester Creatine: Platinum). This was equivalent to 14.25 pills according to the manufacturer's ingredient description. The pill capsules were ground into a powder, which was added to 8 oz of water along with 2 tablespoons of Tang brand orange drink (Tang brand Orange Drink, manufactured by Kraft Foods). Serum Crn was assayed at 0, 1, 2, 3, 4, 5 and 24 hours. Urine samples were obtained and assayed for urinary Crn levels were assayed at 0, 1.5, 3, 5 and 24 hours. Statistical analysis was performed on the serum and urine creatinine levels for both treatment arms using Wilcoxon Matched-Pair signed Ranks Test, and descriptive summary statistics were performed. A convenience sample size of 30 was used to avoid non-parametric data analysis. All 25 subjects completed both arms of the trial and had subsequent serum and urinary creatinine tests performed. All subjects had significant increases in serum Crn (p<0.0001) as well as significant differences in urine Crn from baseline (p<0.0001). Results are shown in Table 1. Table 1. Mean serum and urinary creatinine concentrations (mg/dL) are shown for the twenty-four hours following ingestion of either creatine monohydrate (CM) and creatine ethyl ester (CEE) cohorts. As shown in Figure 1, with creatine monohydrate supplementation, the baseline mean serum Crn was 0.97 +/- 0.13 mg/dL. Peak mean serum Crn was 2.49 +/- 0.81 mg/dL, whereas 24 hour post-ingestion Crn was 0.97 +/- 0.14 mg/dL. In the creatine ethyl ester supplementation the baseline mean serum Crn was 0.94 +/- 0.14 mg/dL. Peak mean serum Crn was 6.71 +/- 1.59 mg/dL, whereas 24-hour post ingestion Crn was 1.13 +/- 0.23 mg/dL. Results are shown in Figure 1. Figure 1. Mean serum creatinine concentrations (mg/dL) are shown for the twenty-four hours following ingestion of either creatine monohydrate and creatine ethyl ester cohorts. All subjects had a significant mean difference in urine Crn (p<0.00). For the creatine monohydrate group baseline mean urine Crn was 217 +/- 90 mg/dL and paradoxically decreased to trough mean urine Crn of 96 +/- 50 mg/dL. In this arm, 24-hour post-ingestion urine Crn was 215 +/- 128 mg/dL. Results are shown in Figure 2. For the CEE group baseline mean urine Crn was 223 +/- 86 mg/dL. Peak mean urine Crn was 900 +/- 565 mg/dL. 24-hour post ingestion Crn was 237 +/- 149 mg/dL. Results are shown in Figure 2. Figure 2. Mean urine creatinine concentrations (mg/dL) are shown for the twenty-four hours following ingestion of either creatine monohydrate and creatine ethyl ester cohorts. GFR was not evaluated using inulin as a standard, comparison assessment. Each individual ingested a standard 10-grams of creatine, and no individual was administered a weight-based dosing. Crn data in both serum and urine may have been different if weight-based doses were used. 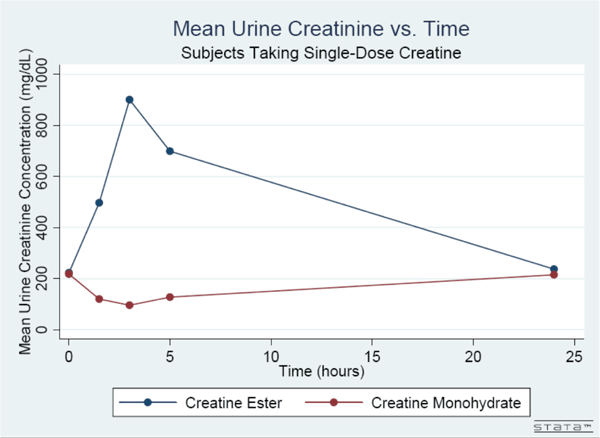 This study was performed for an acute ingestion with lab assays over 24 hours; these data make no comment on the long-term effects of creatine use on renal function. No primary measures of ergogenic effect were ascertained in this study; these data only comment on the behavior of two specific types of creatine and their breakdown product, creatinine. In this study, we show that dietary creatine supplementation can markedly elevate serum creatinine levels, which comports with recent research. However, our measured serum creatinine levels, particularly in the creatine ethyl ester group, are higher that other published data. We propose that this is likely secondary to impurities or non-uniform creatine concentrations in the over-the- counter supplements that were used in this study. Still, perhaps this is more representative of what would be seen in the clinic or ED given that most creatine users are, in fact, using over-the-counter creatine supplements. We also showed that the urinary Crn data of creatine monohydrate demonstrated a curve suggesting creatine absorption. Conversely, the creatine ethyl ester group’s urinary Crn in the creatine ethyl ester group demonstrated a curve favoring creatine excretion. These data, when viewed in concert with previously published data, suggest that users of creatine ethyl ester may break down and excrete it before this supplement is active as an ergogenic substance. With the prevalence of creatine use in the general population reported to be 3% in American adults according to a 2011 NIH Survey and 26% of military recruits, these phenomena are highly relevant to the interpretation of Crn levels in CrM and CEE users (12, 40). Additionally, the incidence of acute kidney injury has increased in both the community and in hospital settings. (15, 23). Currently, the estimated incidence of acute kidney injury is two to three cases per 1,000 persons (14). Additionally, 7% of hospitalized patients and about two-thirds of patients in intensive care units develop acute kidney injury (23). Taken into context, supplemental creatine-induced creatinine elevations have the potential to be a red herring in the evaluation and management of a patient, as the serum creatinine values of those using creatine monohydrate or creatine ethyl ester in this study resulted in an elevation of serum creatinine that are consistent with Stage 2 and Stage 3 AKI per the RIFLE criteria (formerly known as acute renal failure or ARF), respectively. Our study’s results support recent research on supplemental creatine’s effect on serum creatinine levels. Williamson et al. described a case report of “pseudo renal failure” due to isolated, but with normal renal function as measured by GFR and electrolyte levels (39). These findings are further supported by Velema et al. who published a case report where serum creatinine was markedly elevated in a patient supplementing with creatine ethyl ester, but who had otherwise normal markers of renal function and whose serum creatinine normalized within a week upon supplement discontinuation (33). In a randomized double-blind placebo controlled study, Spillane et al. assessed muscle creatine and serum creatinine levels in 30 subjects taking creatine monohydrate, creatine ethyl ester, and a maltodextrin placebo using weight-based dosing over 42 days. Serum creatinine was noted to be much higher in the creatine ethyl ester group at 2.0-2.5 as compared to the placebo and creatine monohydrate group whose serum creatinine values were not significantly different from each other (30). Given the robust data on serum creatinine elevations secondary to supplemental creatine use, it is important to know whether long-term oral creatine supplementation has any detrimental effects on kidney function in healthy population. Poortman et al. found that long-term creatine monohydrate supplementation did not alter either plasma content or urine excretion rates of creatinine, urea, and albumin in subjects supplementing creatine for 10 months to 5 years compared to controls and they concluded from these results that glomerular filtration rate, tubular reabsorption, and glomerular membrane permeability were normal in both groups (26­). Overall, both creatine monohydrate and creatine ethyl ester have the ability to substantially increase serum creatinine levels during initial stages of supplementation, which may potentially alter or inappropriately influence diagnosis and management of a patient presenting to the emergency department with and isolated elevated serum creatinine. While no long-term changes in kidney function have been associated with creatine supplementation, it is important to be aware of possible confounders when evaluating renal function in a patient supplementing with creatine. The authors did not receive funding from any source for this clinical investigation and have no conflicts of interest to declare. We are grateful to the Beth Israel Medical Center’s Department of Emergency Medicine and Albert Einstein College of Medicine. 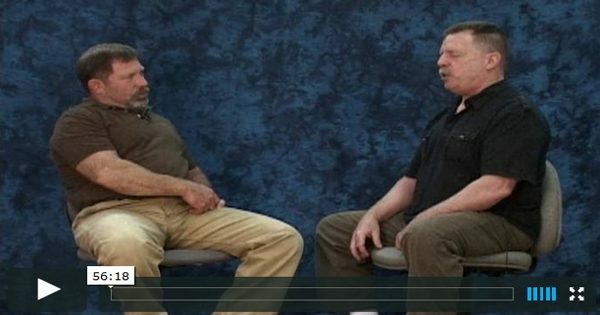 The results of the present study do not constitute endorsement by the ACSM.